On a recent evening on the lush garden patio at Culina in the Four Seasons Beverly Hills, the restaurant’s new executive chef, Luca Moriconi, visits several tables throughout the night. Each time he emerges from the kitchen, he’s cradling a crown-cut wheel of Piave Vecchio cheese. One of the perks of ordering the risotto al carciofi, which translates simply to “artichoke risotto,” is that you get face time with Moriconi himself (unless he’s off duty, in which case his number two in command will show up). A server follows him to a table and drops a smidgen of balsamic vinegar on each plate. While talking to the guests, Moriconi finishes his table-side risotto preparation by stirring the warm rice in a crater at the center of the cheese wheel and spooning out the creamy result onto each plate. It’s part of the 35-year-old chef’s effort to bring back that old-school feeling of getting to interact with the chef and learn the stories behind the dishes. “People should come in our restaurant, eat our food, enjoy our atmosphere, and meet me,” Moriconi says. The artichoke risotto is part of Moriconi’s new Tuscan-inspired spring menu at Culina, a modern Italian restaurant that feels like its own standalone space, one that’s much warmer and cozier than you’d expect at a swanky hotel. It’s fitting that Moriconi’s debut menu would draw inspiration from his home country as well as the bounty of the Santa Monica Farmers’ Market. The chef grew up on a farm in Lucca, a historical city in the Tuscany region, and was inspired by his father’s love for growing produce, as well as making wine and olive oil. “My heritage, my memories, and my traditions are Tuscan, so when I go to the [farmers’] market, I go with a Tuscan mind,” Moriconi says. Even his modern take on the traditional Swiss chard flan (aka sformatino di bietole) harkens back to his childhood. He recalls eating different vegetal variations of the savory custard, from spinach to fennel, rustically served out of a large tray. For Moriconi’s elegant iteration at Culina, he ditches the tray and makes single servings of the flan. 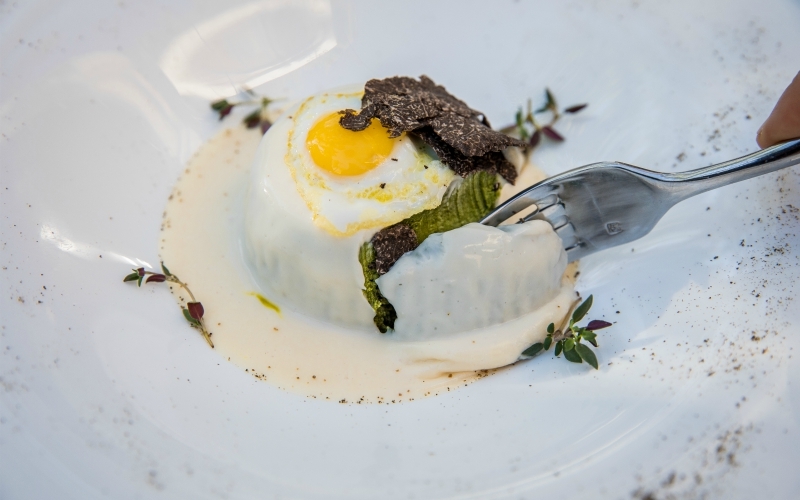 The custard is blanketed by a luscious layer of Pecorino Toscano fondue, and topped with a sunny-side-up quail egg and black truffle shavings. Moriconi credits his mother, whom he says is a great cook, for igniting his passion for the culinary arts, as he shadowed her in the kitchen in his most formative years. He landed his first Four Seasons gig in Florence, Italy, a decade ago, and his journey led him to cook Italian cuisine at the hotel’s different outposts throughout the world, from Damascus, Syria, to Amman, Jordan, and Palm Beach, Florida, before landing in L.A.
His career comes full circle when he brings his 64-year-old mother, Grazia, to Culina from May 7 to 11 for a weeklong dinner-and-a-movie Mother’s Day special at the restaurant. Moriconi says the two of them will be working together to recreate the dishes that his mother made for him growing up, like a wild boar stew with polenta and his favorite: her Swiss chard cake dessert. She’ll be on hand at the dinners saying hello to guests, just like Luca regularly does. As the saying goes, the apple doesn’t fall far from the tree.